The cultivation area lies in the federal state Baden-Wuerttemberg in Germany, It extends between the Lake Constance and the valley of the Tauber below Rothenburg (Taubergrund). The geographical and climatic conditions are characterized by many river valleys. On its very winding course the tributaries Rems, Enz, Kocher and Jagst stream to the Neckar. On the river banks are many southern slopes with widely separated vineyards. These cover a total of 11,435 hectares of vineyards. In summer, there is enough sun to give red wines power and color. 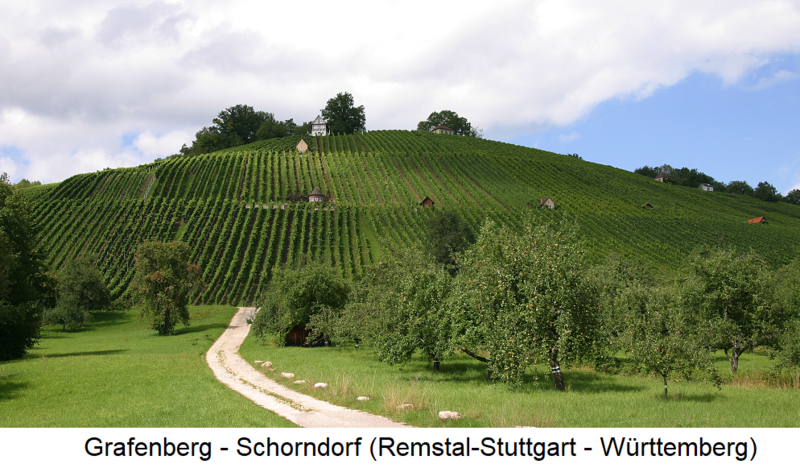 Two thirds of the vineyards are steep slopes or slopes, Around 70 Winzergenossenschaften With its central winery in Möglingen, with 8,500 hectares of cultivated vineyards play a dominant role in production. Heilbronn is the wine capital of Wuerttemberg and to a certain extent also the German one, because here takes place annually the competition of the DLG (German Agricultural Society). The regional winners of the growing regions compete for the medals. In vineyard there is a teaching and research institute for grape breeding, at the August herald (1902-1973) some successful new breeds such as the Dornfelder were created. The soils are characterized by different Keuperformen and on the middle Neckar by Muschelkalkinseln. The cultivation area consists of six areas with 17 large layers and 207 individual layers. The Upper Neckar area is located in the south of the growing area with vineyards around Tübingen. The communities with their individual layers are wide wood with Hinterhalde; Entringen with Pfaffenberg; Kirschau with sun dumps; Reutlingen with Sommerhalde; Rottenburg with Kapellenberg; Tübingen with Sonnenhalden; as well as Wendelsheim with Kapellenberg. The area Bavarian Lake Constance includes the only large-scale Lindau Seegarten with the communities and their individual layers Lindau with Spitalhalde; Nonnenhorn with Seehalde and Sonnenbichel; as well as Wasserburg-Hattnau with vineyard. The large-area area Württembergischer Lake Constance includes only the two municipalities Kreßbronn with mountain dump; as well Ravensburg with Rauenegg. This page was last modified at 22 May 2018 at 15:35.